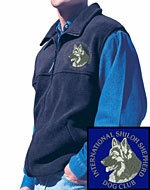 International Shiloh Shepherd Dog Club Logo Embroidered Polar Fleece Vest. We mail these items usually within 2-5 days, depending on the options you selected. Please select Size from the dropdown lists below.